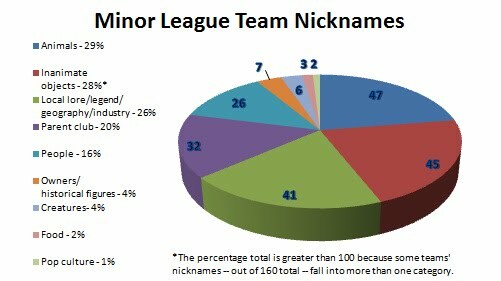 Something inspired me this summer to take a look at the nicknames of the 160 affiliated minor league teams to see what the most popular format was for naming affiliates. What lies behind identities like the 66ers, the Bees or the Silver Hawks? Not all nicknames are created equally, of course. Some are traditional names that have been in use for decades, like the Rochester Red Wings. Others are recent monikers bestowed via fan voting, often when a new franchise is born or a current one shifts into a new ballpark. And then there are, to me, the most boring ones: Those that share the nickname with the parent club. I look at those as unoriginal and a missed opportunity to forge a unique identity or champion the local community. In some cases (for example, in my understanding, all the affected Braves affiliates fall into this category), the reasoning is simple: Those clubs are owned by the parent clubs. In others, it may be tradition (as it was with the Omaha Royals, until this week) or simply an effort to promote the affiliation. The Scranton/Wilkes-Barre Yankees are one exception, changing from the Red Barons when the affiliation changed in 2006. This week, Rob Neyer slammed the change from the Omaha Royals to the Storm Chasers, but I applaud it. Sure, “Storm Chasers” may be a bit kooky, but at least it’s something unique and a conversation starter. It was done because of the move into a new ballpark for the 2011 season and, even if it wasn’t said, to increase revenue. By using the copyrighted name Royals, Omaha could not make as much money on merchandise sales as it can with a name for which it owns the copyright. Plus, I think Neyer’s claim that two capital letters is an automatic demerit is shortsighted. Uniqueness and local flavor outweigh any cartoonish qualities (again, logos aside). Plus, I’ve always been a fan of Lakewood’s BlueClaws nickname. The list of 160 teams comes from the list of affiliates on MiLB.com, excluding the 16 teams of the Triple-A-designated Mexican League and the teams in the “complex leagues,” those that simply use the circuit abbreviation — Arizona League, Dominican Summer League, Gulf Coast League and Venezuelan Summer League — and the parent club’s nickname and play on the back fields of the teams’ spring training and Caribbean complexes. The inanimate objects are pretty self-explanatory — things like Emeralds, Suns and Aces — as are the animals and parent clubs. For teams under the local lore/legend/geography/industry category, I created some parameters, because there could probably be a case made that two-thirds of clubs are named for the region they call home. So for that category, I included only those teams whose nicknames are so unique to their regions that either there’s no other place that can make that claim, or when told the name of the city/state/region, the nickname or something related to it is what comes to mind. For example, Asheville, N.C., is not the only place around known for tourists, so they don’t warrant inclusion in the local category. (Though the name is a bit ironic when you think about native son Thomas Wolfe’s You Can’t Go Home Again.) Nor is Greenville, S.C., the only place known for auto manufacturing (especially BMWs); nor is Mahoning Valley, Ohio, the only place known for steel production. On the flip side, what comes to mind when you think of Nashville? Music. And though Johnny Appleseed may not be the image you get when you hear of Fort Wayne, Ind., he lived out his life there and is buried in the city. For teams named after people, I considered both actual historical people (the Doubledays and Keys fit this description) and general people (like Senators, Mavericks and Indians). The owners/historical figures takes into account teams like the Aberdeen IronBirds, who get the iron in their name from club owner Cal Ripken — the Iron Man. “Creatures” are those mascots of legend (often local) and not necessarily actual animals. The final two, food and pop culture, I added pretty much for myself. Finally, I based these divisions solely on the team’s nickname, no matter what the logo depicts. The Chattanooga Lookouts are named for nearby Lookout Mountain, so even though a “lookout” could be a person (and the logo shows cartoon eyes that could be peering through binoculars), they fall under the inanimate objects category. And though the Everett AquaSox show something that looks like a tree frog in the logo, they’ve been filed under “creatures,” because, as best I can tell, there is no “aquasox” or “aquasock” in nature. You can see the teams listed under their categories here and below are the results represented in pie chart form. Admit it. You added the food category not just for yourself, but for my love of the great Montgomery Biscuit. So much more than an inanimate object.